One way I can have more fun, happy time with the kids is with our new morning routine. I don’t take the twins to preschool every day, but I generally will if the weather is at all nice. 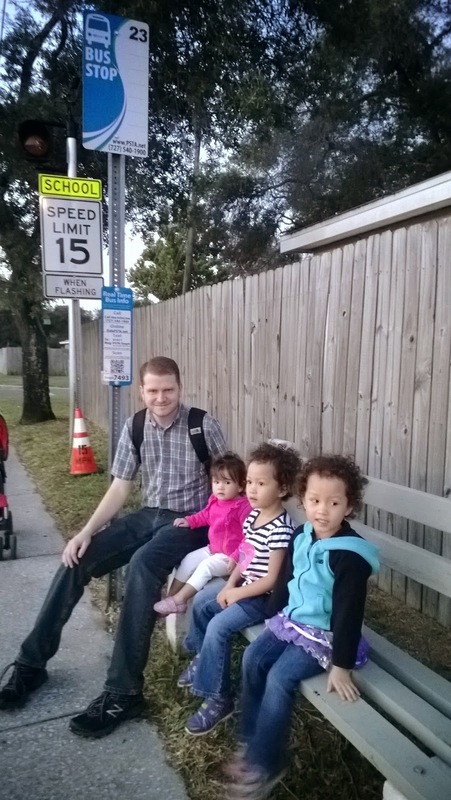 I have often been taking the kids to school in the morning via a walk on the Pinellas Trail and a bus ride on the PSTA Route 23. The kids have such nice daddy time when I walk on the trail with them and we look at birds and squirrels and talk about anything at all. We have a lot of fun on the bus (which I learned is wide enough that they can lie down end-to-end on the back row with room to spare!). Usually while waiting for the school to open they will pretend to be penguins or dogs or roosters or something (they’re four). We have had some very fun and silly mornings this way. After dropping off the kids at school, I can take the next bus to my new job downtown. People usually ask if I save money by taking the bus. It’s possible, but the downtown job location and the bus commute really are lifestyle choices that make me happy. People often assume that the bus is what you use when you don’t have other options, but when I explain how rich my mornings are they understand a bit why I love making this a part of my lifestyle. Actually, even beyond my time with the kids, riding with other people helps me to feel connected to the community. The bus brings together all sorts, and we are literally all in it together for a few minutes each day. To learn more about the Sorenson family, please check out Carl’s blog. Although modern technology has made riding transit easier and more convenient than ever, taking that first ride can still be intimidating for those who have lost their sight. That’s why Southeastern Guide Dogs and the Pinellas Suncoast Transit Authority are partnering to make that experience even easier – by training guide dogs to comfortably and confidently lead their companions when riding transit. 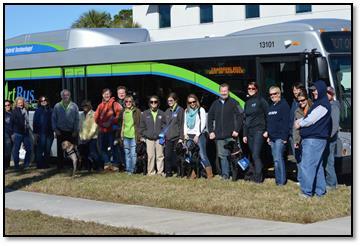 On Saturday, January 18, 2014, seven adorable and exceptionally well behaved guide dogs in training accompanied their handlers on a two hour exercise aboard a PSTA bus. The puppies ranged in age from six months to a year and even though they faced a plethora of new sights, sounds, smells and vibrations, they took the entire exercise in stride. The training involved driving the bus along local streets and stopping at various locations to let the training teams board and alight so the puppies could get used to the various types of bus stops found throughout Pinellas County. “What we try to do is to take them to different places and give them different experiences, so that when they are a working dog, they won’t be upset or distracted and are better able to do their job,” says Southeastern Guide Dogs Area Coordinator John Bauer. “It’s hard work, but when you get to see your dog finally matched with a blind person, it’s immensely gratifying and wonderful to see that dog actually guiding someone and helping them get where they need to go.” Officials say that many guide dogs will be riding transit every day once in service and this kind of training, which simply can’t be simulated in a classroom, is invaluable. Southeastern Guide Dogs is an organization that trains dogs to help people with visual impairments so that it’s easier for them to live independent, vibrant and joyous lives. Through programs such as Paws for Independence™, Paws for Patriots™, and Gifted Canines™ they have more than 400 active guide dog teams across the country. PSTA leaders say that being able to support Southeastern Guide Dogs and programs like Paws for Patriots is a great way to give back to the community and support our heroes who have given so much for our country. 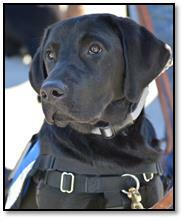 For more about Paws for Patriots or other Southeastern Guide Dogs programs, including how to volunteer or donate, visit: www.guidedogs.org. Press Release: PSTA Board Unanimously Agrees to Ask County Commission for New Funding Source to Improve Transit! 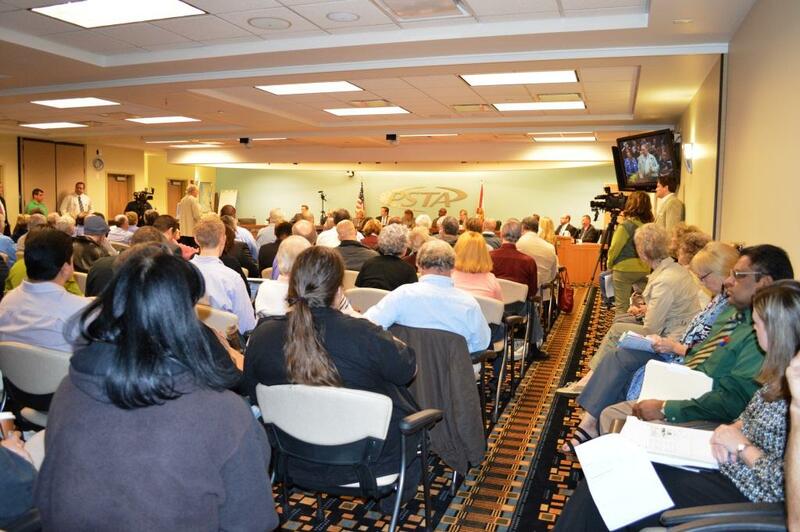 The PSTA Board of Directors made a historic advancement in improving Pinellas County’s transit service. 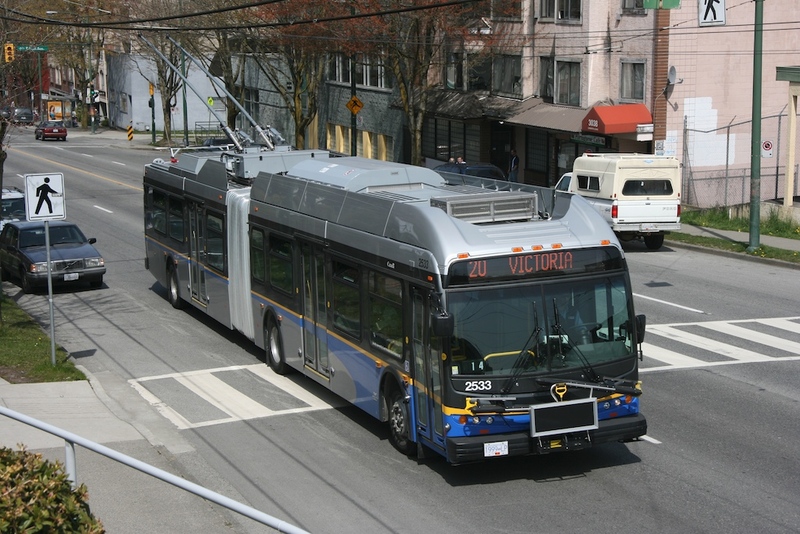 By a unanimous vote at its monthly meeting, the Board agreed to ask the County Commission to include a transit improvement sales tax on the November 2014 ballot moving more than 30 years of planning forward. Financial data shows that PSTA’s current revenues will not be enough to maintain current service levels in the coming years, let alone improving the transit system. On the heels of several years of record-setting ridership and higher-than-ever demand, PSTA CEO Brad Miller advised his Board today, “We are at point where we either ask the county to put a referendum for a new funding source on the ballot in 2014 or start planning to dramatically reduce bus service.” Without additional funding, Miller says the agency would be forced to cut up to 30% of its bus service by 2016. That would be in addition to recent rounds of streamlining and service cuts PSTA has implemented since the recession began in 2008. In fact, those efforts are already underway throughout Pinellas as part of PSTA’s Community Bus Plan. County residents are encouraged to participate and give their input by visiting the Pinellas Community Bus Plan website.